Bee-Bot moves in 6” steps and 90º turns. 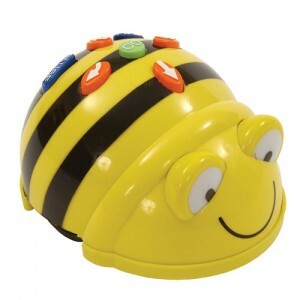 Compact size and durable materials make Bee-Bot child- and classroom-friendly. Bee-Bot is equally adaptable to home and school environments and boosts enthusiasm for experimentation and learning wherever it is used. Bee-Bot is powered by a built-in rechargeable battery. Recharging is done via a standard USB recharger or USB computer port. A USB recharger cable comes with each Bee-Bot. A full line of Bee-Bot materials are available to enhance teaching and learning with Bee-Bot in the classroom. This broad range of products includes curriculum, accessories, and mats. We also offer bundles that combine Bee-Bots and related products to make it easy and economical for schools to bring these exciting new products into their classrooms.This product is brand of techkritya.